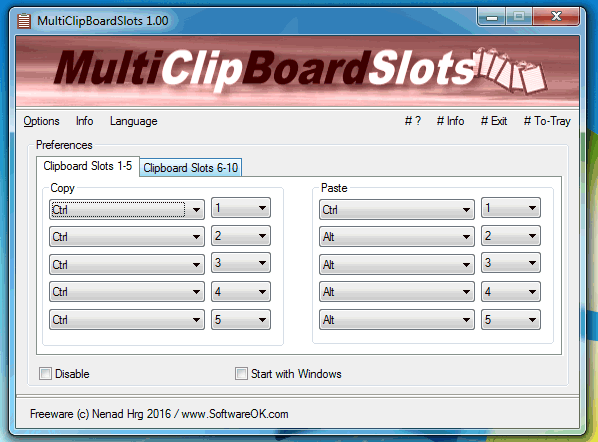 MultiClipBoardSlots is a small portable program that allows you to extend the Clipboard for up to 10 Clipboard Memory Slots (memory storage). This allows you easily to insert text, images, and other objects between the programs via freely selectable Windows shortcut without losing the contents of the Clipboard Slots, because the default Clipboard will be overwritten by other programs. The keyboard shortcuts for the Clipboard Memory Slots are predefined, but always it can be individually adjusted. 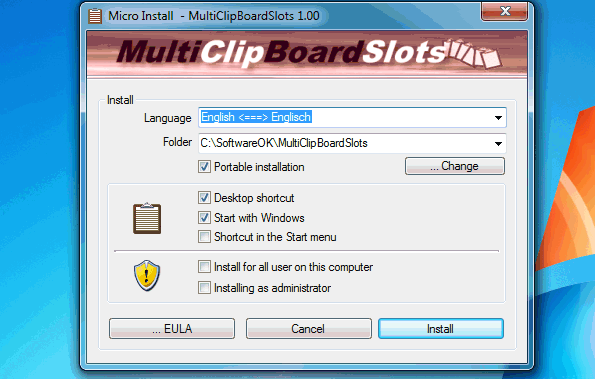 MultiClipBoard Slots can be uninstalled at any time. 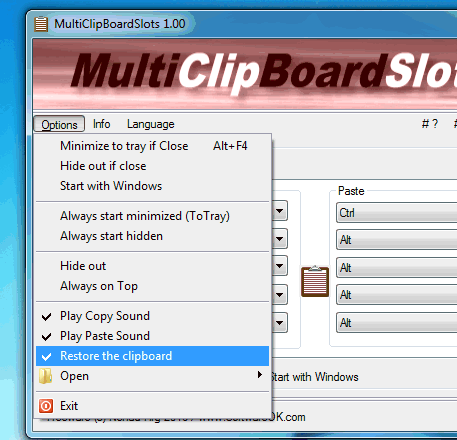 If you do not need multiple clipboards or can not cope with the operation of Multi Clipboard. The installation can be done without any admin rights, this is not required unless you want to install it for all users on the PC. The program recognizes the file as an installation file by the ending _install, by renaming to MultiClipBoardSlots.exe it can be used without installation. As a portable application, it can also be installed, no registry entries are made. Except you want to start the program with Windows. Windows 10, Windows 10 Pro, Windows 10 Enterprise, Windows 10 Home, Windows 8.1, Windows 8.1 Enterprise, Windows 8.1 Pro, Windows 8, Windows 8 Enterprise, Windows 8 Pro, Windows 7, Windows 7 Enterprise, Windows 7 Home Basic, Windows 7 Home Premium, Windows 7 Professional, Windows 7 Starter, Windows 7 Ultimate, Windows Vista Enterprise 64-bit edition, Windows Vista Ultimate 64-bit edition, Windows Vista Business, Windows Vista Business 64-bit edition, Windows Vista Enterprise, Windows Vista Ultimate, Windows XP Home and Pro, X64 and x32 all Windows, Windows Server 2000-2008,Windows Server 2012,Windows Server 2016. • Thanks to Jusebago for the Spanish language. 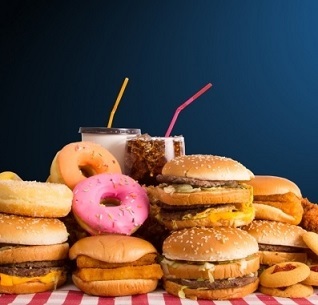 927 2,532 Nenad Hrg <img src="https://www.oldergeeks.com/downloads/gallery/thumbs/MultiClipBoardSlots1_th.png"border="0"> Apr 05, 2019 - 11:10 1.34 127.9KB ZIP , out of 13 Votes.